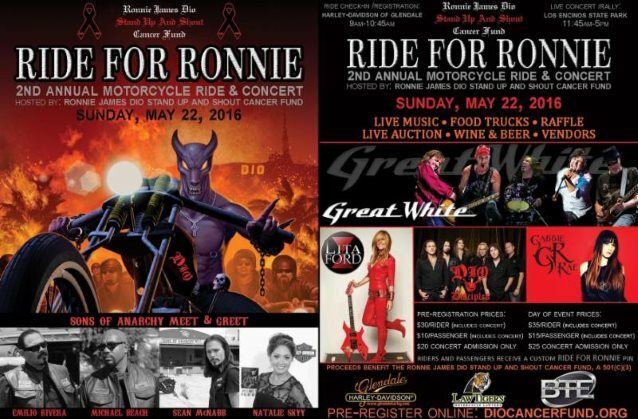 DIO DISCIPLES, which pays tribute to Ronnie James Dio and is fully supported by Dio‘s widow/manager, Wendy, performed three new, original songs during the band’s May 22 appearance at the “Ride For Ronnie” motorcycle rally and concert for Ronnie James Dio Stand Up And Shout Cancer Fund in Encino, California. Fan-filmed video footage of one of the tracks, which is apparently called “‘Till The End Of Time”, can be seen below. Some of the recent DIO DISCIPLES shows have also included singer Joe Retta (SWEET, HEAVEN & EARTH). Joe hails from Rochester, New York and and was raised on ’70s R&B and rock during an era when, as he describes it, “music had more soul and was more diverse.” His influences include such luminaries as Stevie Wonder, Steve Marriott, Paul Rodgers, Robert Plant and, of course, Ronnie.